As fall approaches, night temperatures add a chill to the air, but days bring lots of sunny skies. Your garden beds may be generally dry, but that doesn’t mean they can’t be filled with lively, colorful plants until frost. Color is not only born from flowers, but from interesting foliage as well. 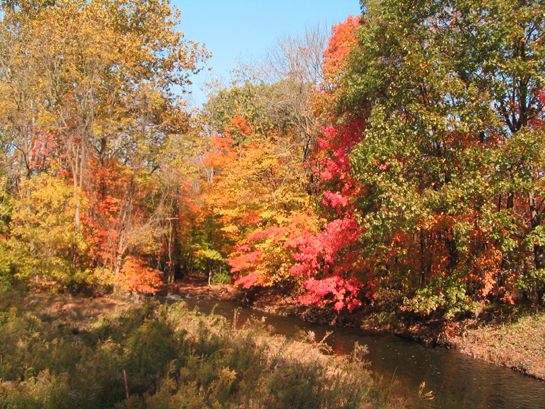 Here, we take a cue from our natural surroundings where the fall colors take center stage. SHRUBS (Many of these can serve as great alternatives to Burning Bush (the non-native and invasive Euonymus alatus). Chokeberry, Red or Black (Aronia arbutifolia, A. melanocarpa): Medium-sized shrubs (8′ x 3-4′), the Chokeberries, named for the berries that birds love, offer spectacular shades of red, orange and purple in fall. Fothergilla, Dwarf or Large (Fothergilla gardenii, F. major): A shrub for 4 seasons of interest, it turns intense yellows, oranges and reds in autumn. Oak Leaf Hydrangea (Hydrangea quercifolia): This 10′ x 10′ shrub’s leaves turn various shades of purple and red. It’s cinnamon colored, exfoliating bark adds another dimension of fall and winter interest. Maple-leaf Viburnum (Viburnum acerifolium): This medium-sized shrub (4-6′ x 3-4′) turns creamy-pink, rose, red and purple. A valuable tree for birds, butterflies and bees, it also offers small fruit that changes from red to dark blue in fall. Smoke Bush or Smoke tree (Cotinus coggygria): A non-native (but not invasive) large shrub that offers yellow, orange, red and purplish-red foliage in fall. Virginia Sweet Spire (Itea virginica): This 3-4′ x 4-6′ shrub loves moist conditions and offers deep purples, reds, oranges and yellows in fall. Bluestar (Amsonia hubrichtii): This easy-to-grow 2-3′ roundish plant creates a great show in fall with its feathery, soft-textured foliage turning a brilliant golden. Heuchera: There are many native and non-native species whose almost ruffled foliage comes in a myriad of colors and fits in well in any garden. Rattlesnake Master (Eryngium yuccifolium): Interesting flowerheads bloom into September on this architectural plant. Turtlehead (Chelone glabra -white flowers, Chelone lyonii– pink flowers): These 2-3′ high plants are great for moist areas of the garden and bloom in late summer into fall). Broomsedge (Andropogon virginicus): This 4′ tall grass turns bright orange in fall. Hairgrass (Muhlenbergia capillaris): Clouds of airy pink flowers on this 3′ tall grass add movement to the garden. Little Bluestem (Schizachyrium scoparium): Growing 18-40″ high, this grass turns bronze-orange after frost. Switch Grass (Panicum virgatum): This adaptable grass offers colorful cultivars, such as ‘Warrior’ and ‘Rotstrahlbusch’, in deep reds. American Smoke Tree (Cotinus obovatus): A 20-30′ tall tree that is deer and drought resistant and offers beautiful shades of yellow, orange, red and reddish-purple in fall. This tree looks unique in summer when billowy smoky pink plumes cover the tree. Black Gum (Nyssa sylvatica): Growing 30-50′ high, this tree turns orange, purple and scarlet red. Its blue-black fruit is a valuable food for birds. Maple: Easy-to-grow Red Maples (Acer rubrum) turn fiery red in fall, while Sugar Maples (Acer saccharum) turn gorgeous shades of orange. Although not native to the U.S., lacy-leaved Japanese Maples add so much beauty in the fall (and spring) landscape. Serviceberry (Amelanchier species): This small tree turns brilliant hues of orange and red. They also attract birds and butterflies. Sourwood (Oxydendrum arboreum): A graceful narrow tree (25-30′ x 20′) that turns yellow, red and purple. Vary heights, textures and colors. Allow for at least 3 different heights (short, medium and tall) in a bed 6-10′ wide. Add interest by balancing textures (fine and broad-leaved or coarse-leaved plants, and rounded and spiked plants). Complement colorful plants with some evergreen plants. Pick plant colors that are similar to adjacent architectural features, such as walls or paving. Be sure to also add some plants that contrast with the feature. For instance, silvers, grays and blues look lovely against bluestone paths or fieldstone walls. Pink flowers look nice around brick with a contrasting color between the brick and the pink flowers. Give your garden depth, using a mix of dark colors which appear to recede, and variegated and bright colors which appear to come forward. Add architectural elements, such as arbors, fountains and sculpture to complement plantings. Highlight some plants at night, especially those with architectural structure, by adding uplighting. Often overlooked, but very important : Consider the mature size of plants when placing them so you won’t have to move them later. If you like, you can fill in blank areas around plantings with annuals for extra color.